Steve Hoefer offers another tutorial in basic skills that everyone should know. Though power saws are fun, there are times where they have much power, not enough precision, or are too unwieldy or inconvenient for a cutting job. When that happens it's time to reach for the hand saw. Just because they're muscle-powered doesn't mean they have to be a pain to work with. A correctly chosen, well maintained hand saw can be a downright pleasurable to use. Even though hand saws look pretty straight-forward, there are few details to know before choosing one. The teeth-per-inch (or centimeter) has one of the biggest influences on cutting ability. Bigger teeth (and lower TPI) are typically for softer materials, and smaller teeth (higher TPI) are for harder materials. Coarse blades with 2-8 TPI are good for ripping soft woods with the grain. Medium blades with 10-20 TPI are for crosscutting and moderately hard materials. Fine blades with 20-30 TPI are for very hard materials and/or very precise cuts. Bigger teeth cut faster, but because they remove more material with each pass, sometimes more than its made to cut. If you're having a hard time starting a cut or getting your saw through your material, try a blade with a higher tooth-count. Trying to push (or pull) a coarse saw through a hard material will not only wear you out, but can damage the saw. Coarser blades also mean rougher cuts. If you need a smooth finish, user a finer blade, though it will take longer to cut. The teeth also have a "set", which is the distance they stick out from the center of the blade. This makes the cut wider than the blade, which is important to keep the saw from binding in the cut. (The width of this cut is called the "kerf".) Most saw blades bend out each tooth in alternating directions to create the set, but very fine blades, like hacksaw blades, are simply wavy on the blade edge. The shape and orientation of the teeth determine how and what they cut. For hand saws there are two common layouts: rip and crosscut. Crosscut saws are for cutting across woodgrain. They have narrow, pointy blades with alternating sharp edges. These work like tiny knives cutting along both sides of the kerf. Crosscut saws typically cut in both the push and pull part of the stroke, but will cut better in one direction, depending on the angle of the teeth. Rip saws are for cutting along the grain of wood. The have coarser teeth than crosscut saws, and only the bottom edges are sharpened. These work like tiny chisels that chip away the wood as you saw, and only work in one direction, either push or pull, depending on the saw. •	Use light pressure. Start slow and let the saw to do the work. •	Don't twist the blade. Keep it perpendicular to your work. •	Use as long of strokes as possible. This will help you make straighter, smoother cuts, will make the blade last longer, and help the blade remove sawdust efficiently. •	Clamp your work securely and support it well. Double check the area behind the material so that you don't saw into your sawhorse or anything else you might regret. Be sure to remove any nails or staples that might be along your cut line. •	If 90º or 45º angles are critical, use a miter box. If you're making a long cut, clamp a 2x4 along the cut line to keep the saw on track. •	To get straight cuts, pay more attention to where you want the saw to go than where it is. •	To minimize splintering, apply masking tape along both sides of the cut, and run a utility knife along the cut line before you saw. •	Keep your blades sharp and true. Before you start sawing, sight down the blade to make sure it is straight, flat, and none of the teeth are bent too far from the center. Sharpen or replace dull or bent blades. •	To protect the blades (and protect you from the blades) either slit a length of garden hose, or visit the office supply store and get some slide bars for binding report covers. These cheap U-channel plastic strips slip easily over smaller saw blades and help keep them straight. •	Keep your saws clean and dry. Dirty blades are more likely to rust and bind. Most saws will stay rust free when kept clean, in a climate-controlled area. Rust can be prevented by rubbing the blade with a light oil, however don't oil or wax blades used for fine woodworking. The oil can penetrate the wood and cause blemishes. •	Sharpening and setting saw blades can be done by hand, but it takes special tools (or a lot of experience) to do it right. Doing it wrong can ruin the blade. But a dull saw can ruin your work. The carpenter saw is the stereotypical hand saw. A large sculpted handle and long, slightly tapered blade. While they're the most common, they're often not the best saw for the job. The one thing they surpass all other saws on this list is by being the biggest. They have the widest kerf, and beginners often find them hard to use. That said, they are incredibly popular, and most basic workshops will have one. The blades are removable, but actual replacement blades are hard to find. They come in both rip and crosscut styles, though crosscut are more common because they're more versatile. You can rip with a crosscut saw, it will just take a little longer. Trying to use a rip saw to crosscut will take a long time and leave a very ragged cut. When using a carpenter saw, hold it at 45º to the work for crosscut saws or 60º for rip saws. Start your cut with a few, slow back strokes, using the knuckle of your thumb to keep the blade perpendicular and along your cut line. Once you have your cut started use long, consistent strokes. Use for: General rough cutting of soft materials--if you don't have a better saw available. Back Saws are similar to a carpenters saw, but shorter, and with a reinforced top edge to reduce flexing. The weight of the spine helps put even, gentle pressure on the thinner, fine-toothed blade. These features make it easier to control and produces more precise cuts. 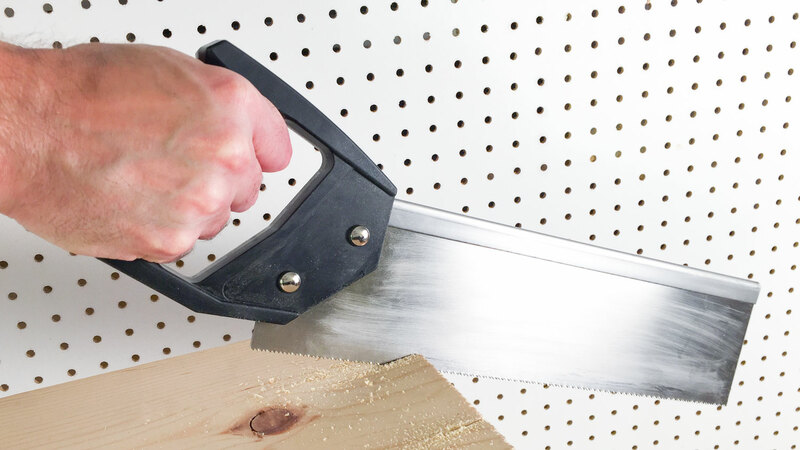 Since the brace along the back is wider than the kerf, it can't actually pass completely through its cut, so you'll have to choose another saw when cutting through that railroad tie or piece of plywood. Like a carpenter's saw, the blades can be sharpened, and most of them can be replaced--though it's hard to find replacement blades. Use for: Creating tenons, dovetails, and other joinery. Working with a miter box. 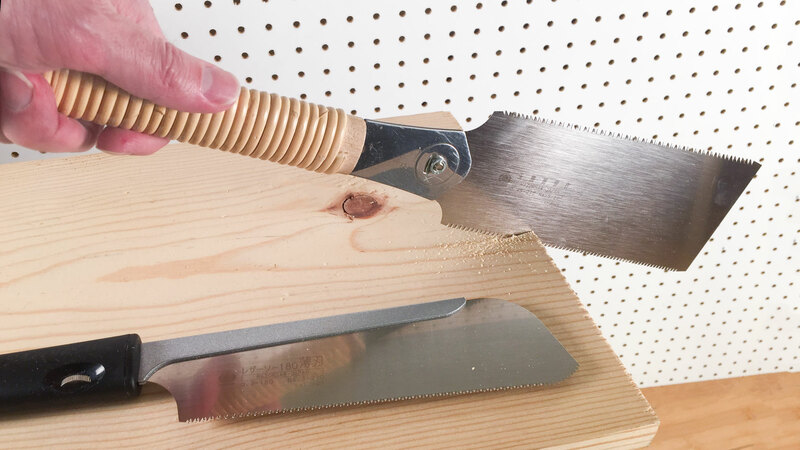 Japanese pull saws are becoming more common in non-Japanese toolboxes, and Western manufactures are starting to sell their own versions of these traditional woodworking tools. They're popular because, for most beginners, they're easier to use than Western saws. Unlike the carpenter's saw, they do most of their cutting on the pull part of the stroke rather than the push. Although it's a small change it has a dramatic effect on how they work. Cutting on the pull stroke automatically tensions the blade straight as it cuts. This creates straighter and more accurate cuts. Unlike cutting on the push, where the user tends to put their weight into the cut (and where novices often get into trouble, flexing the blade), pulling ensures gentle downward pressure on the saw, making it bind less. Pull blades are also thinner than their push counterparts, since they don't have to withstand the pressure of pushing while they cut. Thinner blades mean smaller kerfs. Since less material is removed you can saw with less fatigue. The down side is that cutting on the pull stroke puts most of the sawdust on top of what you're cutting. That can obscure cutting lines, though experienced carpenters know the secret to straight cuts is to pay more attention to where you want the saw to end up than where it is right now. There are several different kinds of Japanese saws, but the most common are the ryoba and the dozuki. Ryoba are functionally comparable to a carpenter saw, though they're shorter, and double sided. One side has coarse teeth for ripping, the other has finer teeth for crosscutting. The smaller size and dual blades make them an excellent multipurpose saw. The blades are replaceable and come in lengths from 200-300mm (8-12", not including the handle). Dozuki are comparable to a back saw, with a single fine-toothed crosscut blade and a reinforced back edge. They have the thinnest blades you can find (0.3mm or 0.01", with a 0.5mm or 0.02mm kerf) making them a favorite of woodworkers doing fine joinery. Use for: Cutting with precision and ease. When you want to impress people with how worldly your toolbox is. 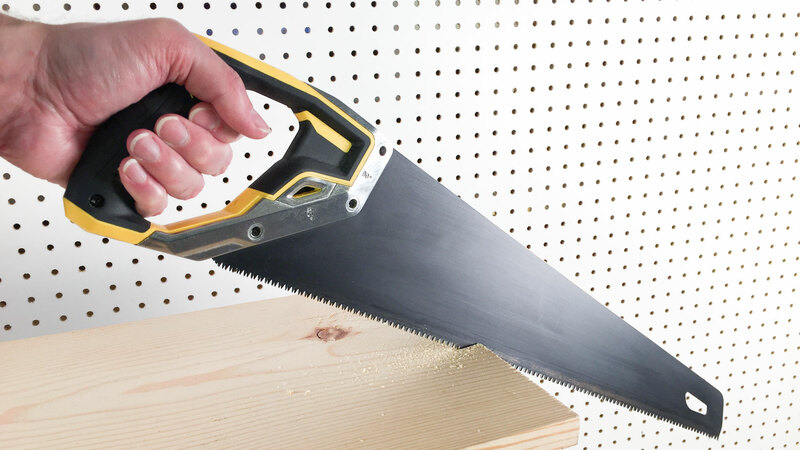 Hacksaws are often shamed by their powered cousins because cutting steel by hand can be fatiguing. That said, hacksaws are cheap, light, and easy to keep in your toolbox for light-duty or occasionally metal cutting. And they fit in places where their powered cousins can't. They come in two popular shapes. The more popular bow is for serious sawing since it can hold longer blades and tensions the entire blade. They have adjustments to tensions the blade, and many models are adjustable for different length blades. 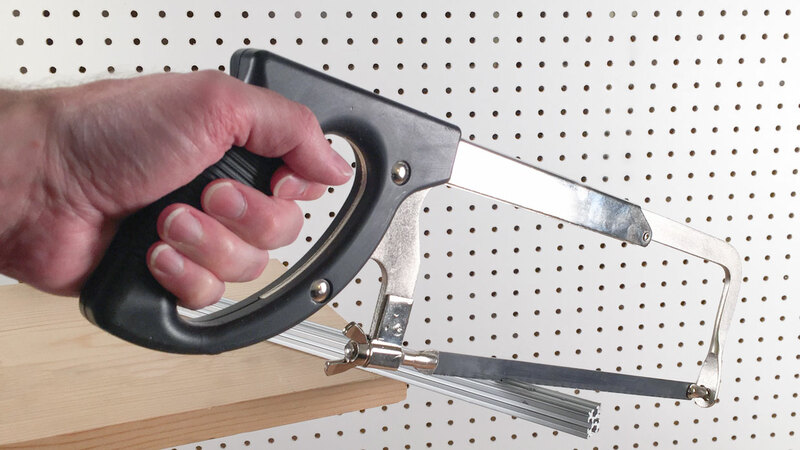 Mini hacksaws--essentially just a handle for a hacksaw blade--are good for very tight spaces, but are otherwise harder to use since they tension only part (or none) of the blade, making it harder to push through material. While the blades can be installed to cut on either the push or pul stroke, they're generally mounted to cut on the push to get more power into the stroke. 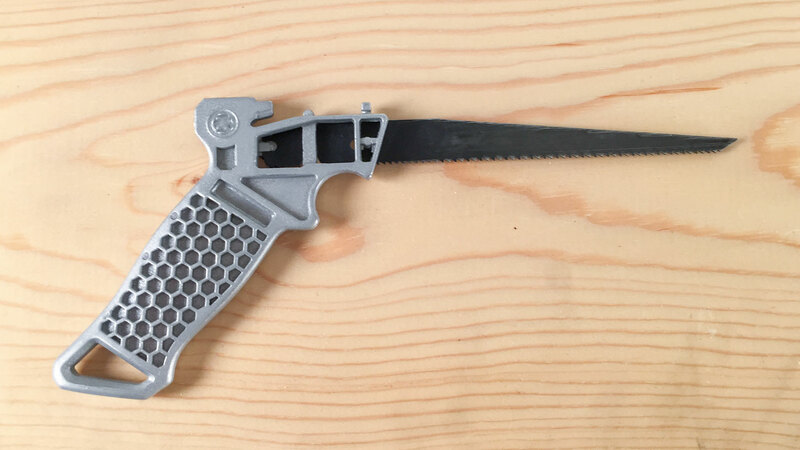 Full-sized hacksaws have thumb screws to tensions the blade. It should be turned until the blade is tight and secure, and won't flex when pushing it through your material. Avoid over-tensioning, which can make blades break more often. The blades are affordable and easy to replace. Pair the blade with the task. General purpose blades are fine for copper and mild steel. Use bimetal blades for harder metals, and specialty blades for other hard materials like brick, tile, or glass. Use for: Cutting metal, masonry, tile, and glass. Also make quick work of very soft plastics like PVC and styrofoam. Coping saws are the first choice for cutting fine details. They get their name from one of their common uses: coping a moulding (e.g. : Shaping the edge of a piece of wood to match the intricate profile of a moulding.) It's horrible at cutting straight lines, but peerless when you need a tight or complex curve. The blades can be oriented so they cut on the pull or push stroke, but cutting on the pull generally breaks fewer blades. 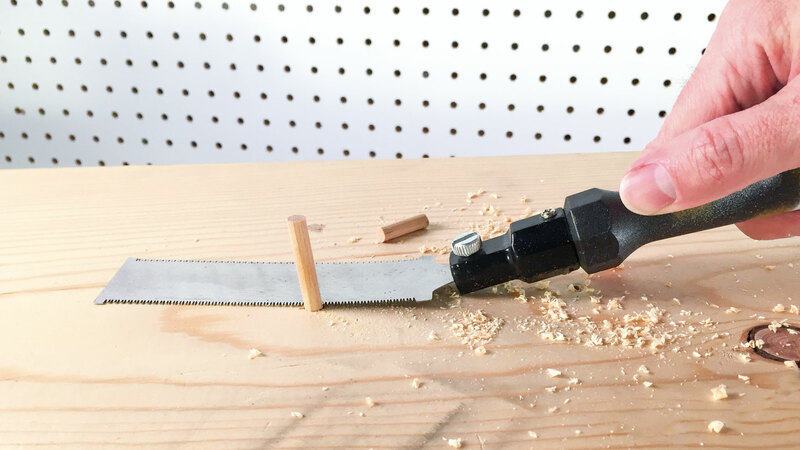 If you need to cut a completely enclosed shape, drill a 1/4" hole in the center of your work and put the blade through the hole before fastening it into the saw. Don't bother sharpening these blades. Buy them by the dozen and replace them as needed. They break often. Turn the handle to tension the blade. The tensions will be correct tension when the frame is taut and you can saw without the blade visibly flexing. Don't over-tension or you'll break blades. Since the handle controls the tension, and it's hard to saw without holding the handle, regularly check the tension while sawing. For highly detailed work look for a fretsaw, which is like a coping saw with a deeper frame for working on larger pieces, and a thiner blade for turning sharper corners. If you're working with metal, look for a jeweler's saw. It's smaller for finer control, and has more blades appropriate for cutting metal. They're often used with bench pin, a tongue of wood with a gap cut out to support and guide the metal while sawing. Use for: Tight curves and fine details. Flush cut saws are special purpose saws for making a flush cut without damaging the surface you're cutting along. They're typically used to cut the protruding bits of dowels and other joints and fasteners. They look a lot like a tiny Japanese ryoba, with a thin, double-sided blade, but they are subtly, and importantly different. The blade is extra thin, designed to bend so it can slide along a surface, even while the handle is at an angle. More importantly (and why you shouldn't use a ryoba for flush cuts) the bade typically has a no, or minuscule set. This will keep the teeth from scratching the surface you're cutting along. But it also makes them bad for longer cuts since the narrow kerf will tend to bind the blade. Their flexibility also makes them bad at cutting without a flat surface to guide them. Check that the teeth are all in line before using them. A bent tooth can quickly scar the surface you're cutting along. The blades are disposable and replacements are pretty cheap. 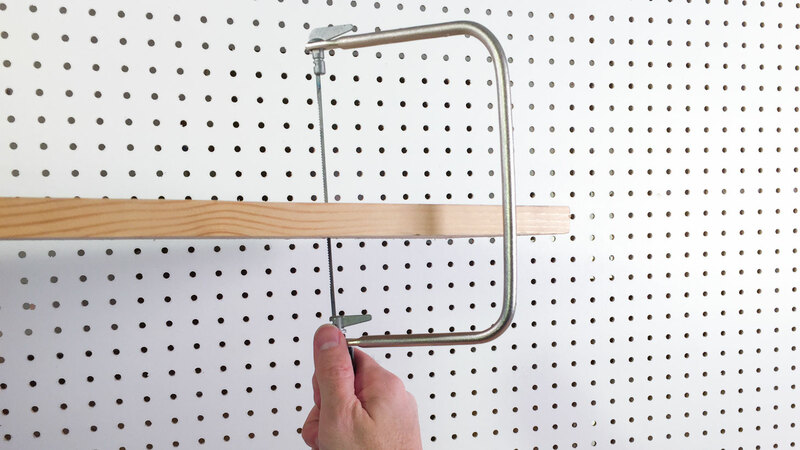 Use for: Cutting off dowels and any time you need to make a short cut in a confined space. They're also small enough to carry in the toolbox for quick, small cuts through most soft materials. These are all very similar: a thin wedge of a blade for cutting freeform holes in thin material. They're generally used for cutting holes where you can't use a coping saw--for example in the deep interior of drywall or plywood. Cutting holes for fittings and pipes is a primary use. The thin blade makes it possible to turn moderately tight corners. The blades are usually quite coarse, making them okay for rough work, but not for finish carpentry. The "jab" type has a sharpened tip for poking through drywall so you can start a cut without drilling a hole first. The blades are easily replaceable, and come in a variety of types, depending on what you need to cut. And the blades are cheap, which is good because these saws lend themselves to rough handling and broken blades. Use for: Cutting rough holes for fixtures, pipes, etc. in drywall or plywood. Their small size also makes them toolbox friendly.